In 2000, I read about guru Matt Chester in Dirt Rag. I own UtiliTiman #16; I read what Matt writes, including his philosophy of 700c fixed bikes as the authentic bike for our times. From gifted Canadian builder Hugh Black (True North Cycles), I ordered a cyclocross frame and fork. Apart from its modern alloys and paint, my bike could have been built in 1896. My taste: lugged, silver-soldered construction, with Reynolds 531 tubes. 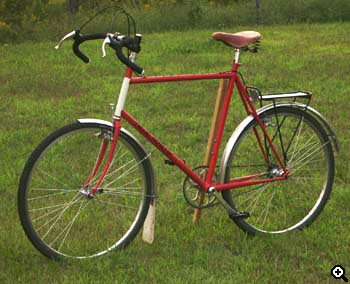 Most of my fit specifications are a tribute to the experiments and writings of Grant Peterson of Rivendell Cycles. At my LBS, I found new old-stock parts: mid 80's Dura Ace crankset, old 36 hole Shimano cassette mtn hubset, old brake levers, etc. With now-out-of-production WTB cyclocross bars, Surly Fixxer to hold my sprocket, Paul Neo-Retro cantis, a Brooks B67 saddle, Schwalbe Marathon XR tires, prosaic CR-18 rims, my seven-league boots were set to stride. What a ride this is! The big wheels, low-Q cranks, sweet fit, lithe, supple frame and spindly, rugged fork, along with Uber-capable Schwalbe tires yield a superb, stone-axe-simple juggernaut. Normally I ride 53x22 gear. I put on a 2:1 ratio, removed the mudguards, and entered a 40 km mountain bike race, in the rolling Ganaraska Forest, a bit east of Toronto. Since I feel better after a half hour's riding on my normal explorations, I rode a lap of the course to warm up. Each lap was over 11 km, and I was 2 minutes late for the start. Truly, I was never "in the race". I did have a grand time, not to mention gaining deeper self-knowledge and greater humility. This is what fixed gear cycling is to me. I rode 54 km, and climbed well over 1,000 meters, not a little of it on foot! My gear was a bit too tall. I knew it would be gruelling to pedal down every hill, on the drops, using the brakes. How right I was! On one short steep bit, I made my only trip over the handlebar, landing softly on underbrush and loam. The bike steers like a dream, threads through tight, gnarly spots in good humour, and climbs forever - if my legs are keen. It seems to tread lightly, which is a good feeling in a bike. Other memorable trips include my first double metric century, and a 29 hr, 260 km camping trip, running on sandwiches and hardboiled eggs. I ride a lot, rarely using a car (thanks, Matt!). Fixed gear is now ingrained in me, and I elucidate, mostly to myself, the raison d'etre: my bike is an eager companion animal, straining to keep going, even if my enthusiasm flags temporarily. It is wonderful to feel wholly connected to the earth, riding fixed. It builds my character. Isaac Newton said: "If I have seen farther than others, it is because I have stood on the shoulders of giants". I owe debts of gratitude to Matt Chester, Grant Peterson and Hugh Black. Larry participated in this year's Icebreaker. Hugh Black's True North Cycles have their own site.